I honestly couldn’t imagine having chickens free ranging in my yard if I didn’t have the Chicken Herder. The girls are always testing boundaries, much like a young dog. They go where they know they aren’t supposed to, and even after being chased away, they simply wait and do it again. The Chicken Herder and I have trained and trialed in herding over the past couple of years. But, in the past few months our training has taken a nose dive and my little Chicken Herder has lost some of her confidence. So, I thought herding the chickens might be a good way to get her confidence back, and possibly help with chicken chores. I honestly had no idea how much I would come to depend on her! I like to let the girls free range whenever I’m home, being either outside with them or on the other side of a warm window watching them. Their actions are fairly predictable, but every now and then a few of them will try and break out from the temporary fencing I have up. My whole yard is fenced (which they really can’t get past), but I like to keep them contained in a smaller area, so I can see them all. They have plenty of room, but for a few of them the challenge of going beyond what I have given them is just too tempting. Enter the Chicken Herder. She now knows her job, and the chickens know that. It’s to the point where all I have to do is call for the Chicken Herder and the chickens flee the crime scene, pronto! My once unsure Chicken Herder then struts her stuff around like she knows just how valuable she is when it comes to keeping chickens in line. There are still some maneuvers the Chicken Herder and I have yet to master, but we’ll get there. All in due time. I learned early on that herding is a journey—a very long and sometimes trying journey—but one I would do over and over again with my little Chicken Herder. She is truly a treasure beyond measure. Even though my girls get to free range daily, they seem to sometimes get bored. That is, every time I approach them they rush towards me as if to say, “Oh my gosh, we have missed you sooo much—please entertain us!” Or, maybe they’re just saying, “Where ARE our treats, lady? 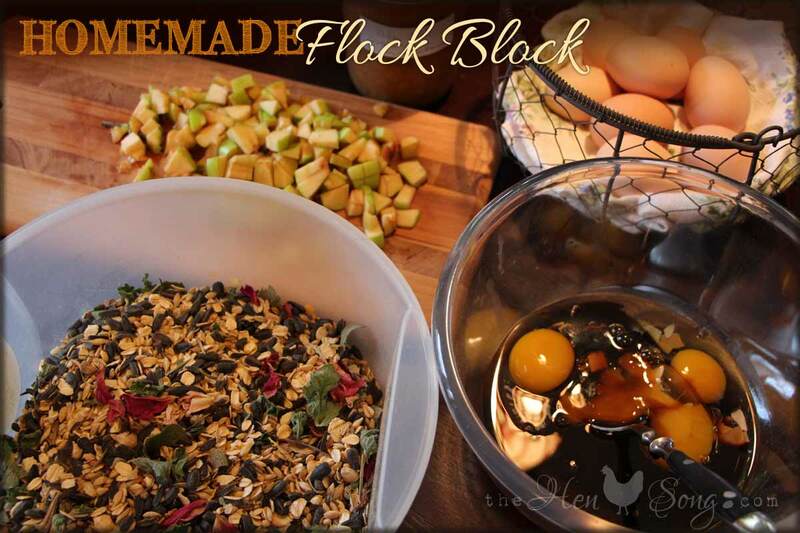 !” Either way, I decided to try my hand at making my own Flock Block. I read a few recipes, but none really fit what I was looking for. So, I created my own, and it came out rather well. I did initially make a hole in the block, thinking I would hang it, but I was afraid it would break. So, instead I hung the block in netting. And, I think the netting will help make it last longer. I used ingredients I had readily available, so of course I added many herbs like rosemary, thyme, sage, as well as rose petals and dried rose hips. Preheat oven to 325˚F. Mix dry ingredients together. Mix wet ingredients together. Add wet ingredients to dry ingredients, and mix well. You may need to get your hands messy to mix it well. It should somewhat stick together, but not be dripping wet. 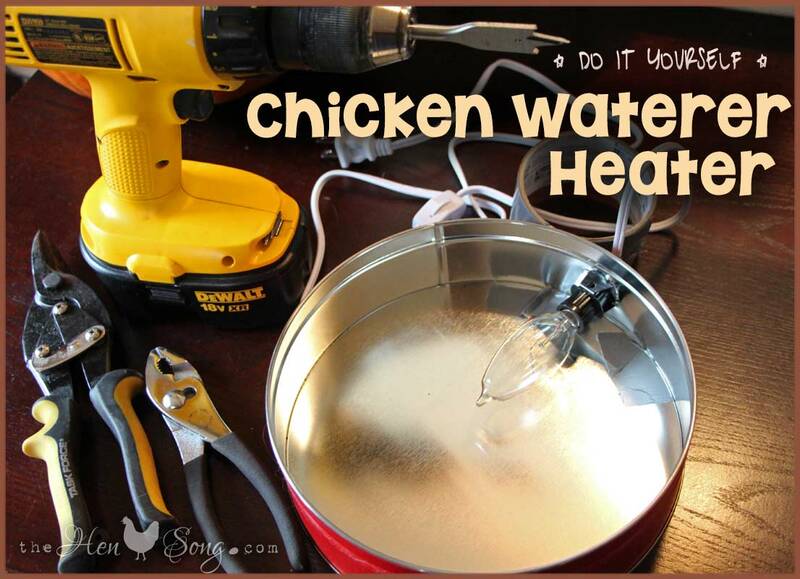 Add more water or dry ingredients to get right consistency. Spread in greased pan (I used a bread loaf pan) and pack it down. Bake at 325˚F for 2 to 2.5 hours. Let it cool in the oven (for a few hours, or better yet, overnight). 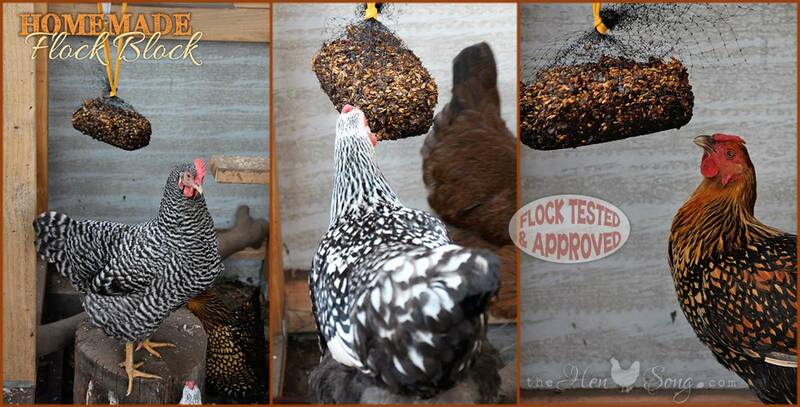 I decided to put my flock block in netting and hang it. It works very well, and I think it helps make it last longer. Other ingredients I might try using next time include applesauce, sprouts, different herbs or flowers, and whatever I have on hand. So, give it a try. Use what you have, and give your girls some fun feeding time. Mine seem to really like it! With temps dipping below freezing, I’ve had a couple mornings with frozen waterers. That meant the procrastination of deciding what kind of waterer heater to get was at an end. It was time to decide how to prevent the waterers from freezing. Do I buy a ready made heated waterer? Do I use a heated dog bowl? Or do I try my hand at the homemade variety? After a trip to a couple of stores to see what was available locally, I decided to go the homemade route. Since I have a number of tins which could work, why not? I bought a Candelabra Base Switch Cord for around $4. SInce I have a few candelabra lights in the house, I already had the bulbs. I had one tin which was about the same diameter as my waterer. It wasn’t very tall, but perfect for using a candelabra light inside. I placed the tin under the waterer and it fit perfectly. So, I gathered a few supplies (see photo) and started by drilling a 1″ hole in the side of the tin, which was easier than I thought it would be. I then pushed the candelabra base through the hole. It has a metal clip which snaps in the hole to help keep the bulb base in place. I added a thin piece of metal under the base of the light as an additional support, just to make sure the light would sit between the base and lid (and not touch either). True to Alaska fashion, I used duct tape on the outside of the hole to keep cold air and water out. I placed it under my waterer and plugged it in. Viola! Since making this heater and installing it, the temps have stayed above freezing. (Figures, eh?) But the tin is warm when turned on, and I think it will work nicely. It was easy (and inexpensive) to make. The girls don’t seem to be pecking the cord (I have the waterer close to a 4×4 post, to which the cord is attached). The cord comes with a nice on/off switch, though I am planning on plugging it into a thermocube, which will turn it on and off depending upon the temps. So, we’re ready for the freezing temps now. Happy day! I’ve been wanting to make a rosemary bread for some time. And, I’ve wanted to use egg in a bread recipe for some time. This turned out to be the perfect combination. 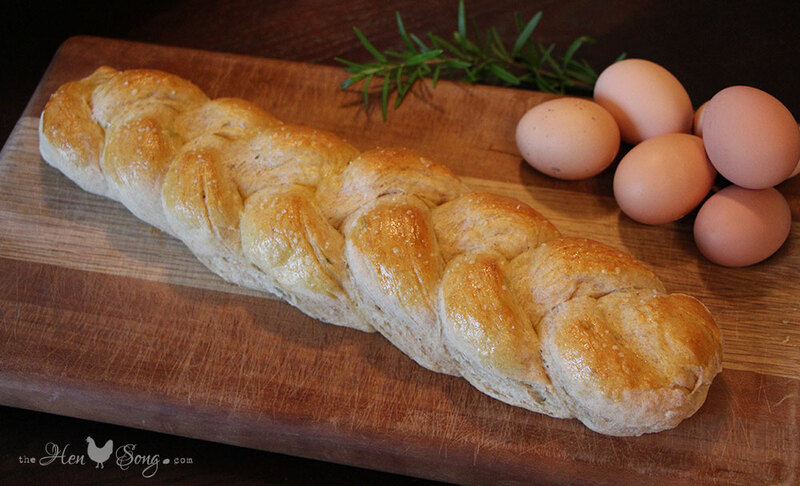 This bread tastes great with just butter on it, or as a side to over easy eggs, or for dipping in homemade red sauce on pasta. Mmmm! I’ll admit I’m not one for following recipes exactly. That is, I like to “wing it” more often than not. I modified this from the rosemary breadsticks recipe in this month’s Mary Janes Farm magazine. I used organic ingredients whenever possible and I used local (Hatcher’s Pass) honey. In a small bowl, whisk together the water, butter, honey and yeast. Let it sit. In a larger bowl, mix together 2 c flour, rosemary and salt. Add the yeast mixture to the flour mixture, and mix well. Add more flour until the dough chases the spoon around the bowl. Turn out on a floured surface and knead, adding flour as needed (I used whole wheat flour here). Form dough into ball and place in a lightly buttered bowl. Turn ball of dough over (so butter is on top of dough). Cover with plastic and set in a warm place for 45 min to let dough rise. Preheat oven to 400ºF. Turn dough out on floured surface, knead, then separate into six balls of dough. Roll each ball into a long piece of rope. Take three “ropes” and attach at one end, then braid, and pinch end under. Do same with remaining three ropes. Cool on rack, and try not to eat it all before it cools. Good luck! Next time, I’m going to add more rosemary, and maybe some sage and thyme. Braiding in a circle would be fun. Oh, the possibilities are endless! So… it is just me, or has it become more difficult to get up during these darker and colder Alaska mornings? I have a fuzzy alarm clock sleeping next to me which helps, to a degree. But on some mornings, I don’t think dynamite could dislodge me from my warm and cozy flannel sheets. 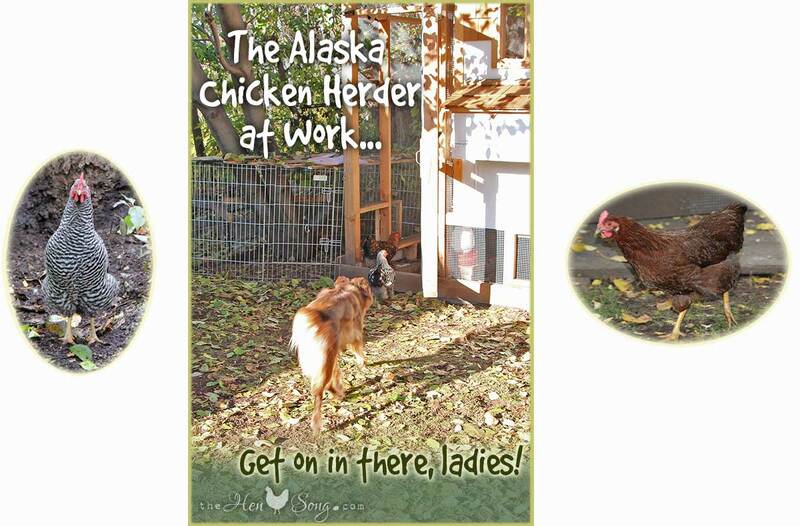 A quick walk to the house and I opened the door, called for The Chicken Herder… and off she went. I told her to round ’em up and put ’em back in. And that she did. Maybe it’s because she hadn’t had breakfast, yet, but she was a bit more, well, full of herself. I had to tell her to slow down a couple of times. 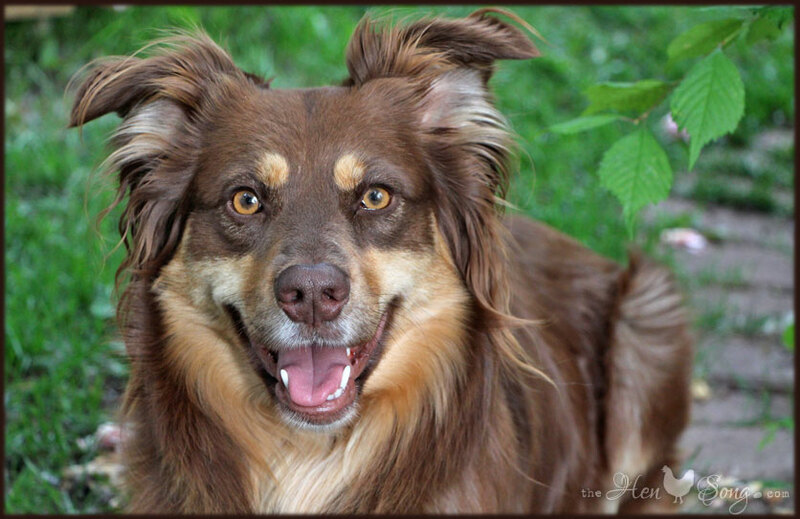 But, given that we have been working on getting her herding confidence back up, I was just thrilled to see her work so enthusiastically. It may sound odd to someone who doesn’t do herding or have stock, but I’m so happy to have my enthusiastic, super fast herding dog back! Please note–The Chicken Herder does not hurt the chickens in any way. She merely applies pressure from behind to get them to move in the desired direction. A good stockdog is worth her weight in gold! 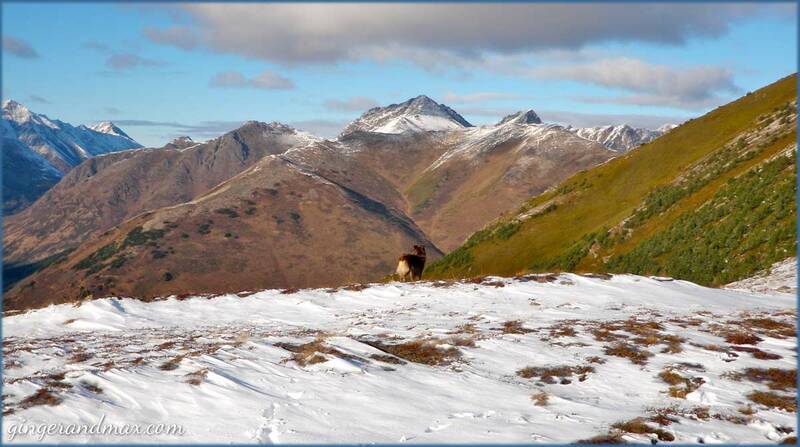 Yesterday was just too gorgeous here in southcentral Alaska to not get out and play. After a brief discussion with Ms. Chicken Herder, we decided a hike up Bird Ridge with its southerly slope was just what we needed. It was sunny and warm (for Alaska), mild wind, and not a cloud in the sky. Bird Ridge is one of those hikes that is like climbing stairs, but you are well rewarded for every step with breathtaking beauty all around you. With each new step, there is a new view–a new snow capped mountain comes into view, a bore tide surges below, an eagle soars high above. It truly is paradise. I wasn’t really planning on going all the way up. You can get some pretty spectacular views at the lower altitudes. But it was such an awe-inspiring day that time simply stood still, and we frolicked here and there, up further and further, among the jagged rocks and crisp snow. The colors were surreal: verdant green, snow white, and electric blue. I never gave sprouts much thought before I got chickens. I liked sprouts. I would eat them. But, I had no idea how nutritious they were, or how one goes about making sprouts. Sprouts are one of the superfoods. They contain up to 30 times more nutrients than organic raw vegetables. The protein, fiber and mineral content increases significantly during the sprouting process. There is claim to reducing cancer and losing weight just by eating sprouts. There seems to be no downside to growing and eating your own sprouts. You’ve heard of wheatgrass and all it’s health benefits, right? Well, why not grow your own? It’s easy, it’s fun, and it doesn’t get much fresher than being grown right in your own kitchen. You can sprout grains, seeds, beans and pretty much anything that grows. I’ve experimented with various grains, and just recently started sprouting sunflower seeds. They take a bit longer than wheat or barley, but the chickens love them! I sprout various types of wheat–I like them all, and the gals do, too. I like the idea of being able to give my chickens fresh sprouts year-round. The quality of eggs they give me is a direct result of what I feed them (along with how I treat them, of course). To sprout your own seeds, beans, or whole grains be sure to get the kind that have not been sprayed with chemicals, which may inhibit growth. You can get them in supermarkets, natural food stores, etc. 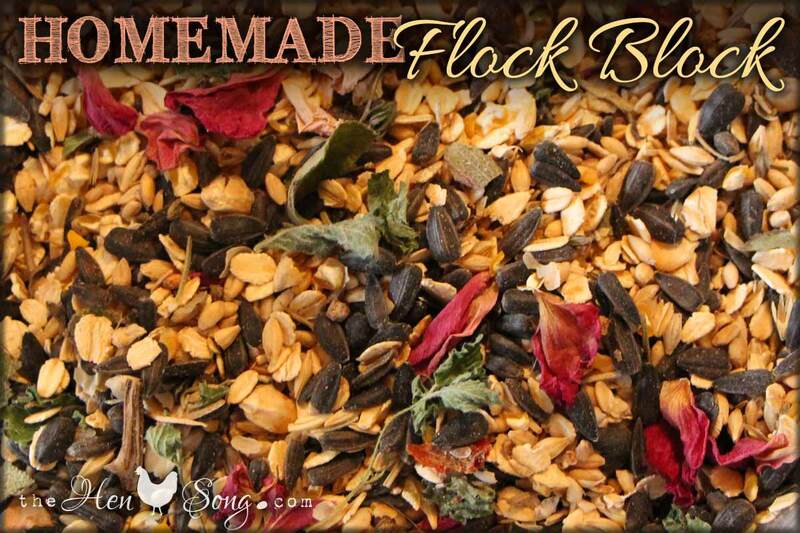 I use black oil sunflower seeds that are sold as bird seed. Here’s how I go about making sprouts: I place about a handful of seed or grain in a canning jar, fill it with cool water, and let it sit overnight. 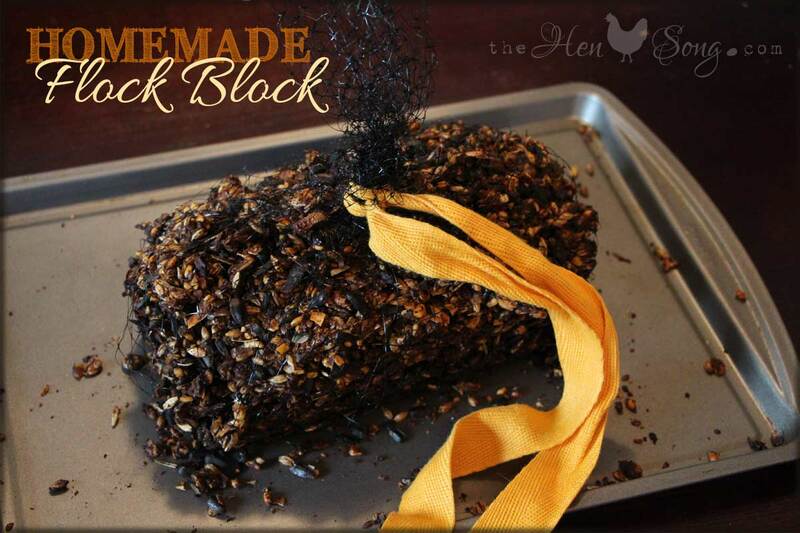 I place a piece of cheesecloth over the top and secure it with a rubberband or two. (I’ve found rubberbands work better than using the canning ring, though those will work in a pinch.) After about eight hours I drain the water out, rinse it a few times, and let it sit in a dimly lit corner of my kitchen counter. I rinse them 2-3 times a day. In about a day you can see the grain start to sprout–it will grow a little tail. In about three days, the sprouts are ready for eating or feeding to the chickens. Some will take longer. 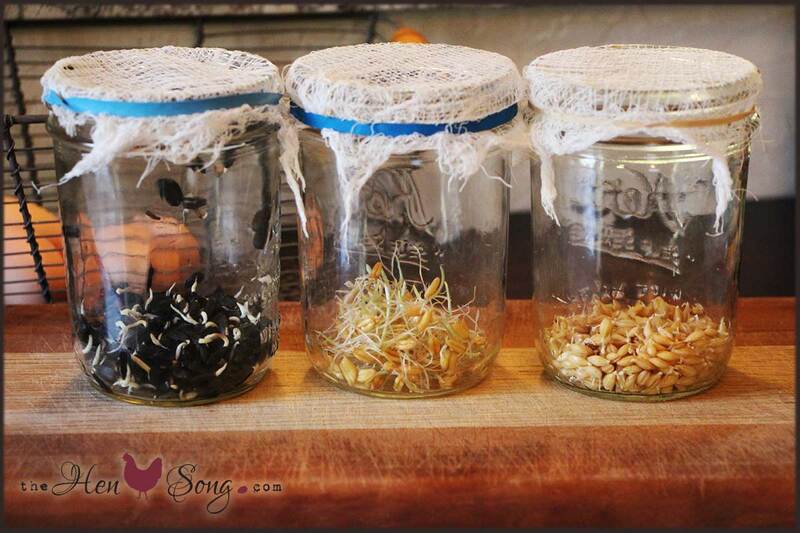 At any given time, I usually have 3-5 jars sitting on the counter, all in various stages of sprouting. Have a super sprout-filled day! There’s nothing like freshly made hot tea to take the chill out of the air, especially when it’s made with fresh mint and rose hips from the garden. It makes a great breakfast companion to my farm fresh eggs and homemade bread. Ah yes, the simple things in life are what put the biggest smile on my face. With rose hip mint tea in hand, I head out in to the cold, frosty morning to let the girls free range for a bit in the sunshine. As I open the run door, they rush the entrance, tripping over one another. Slow down, girls! There’s plenty of outdoors for everybody! They are characters. Once they hit the grass heads bow and the nibbling begins–frantic at first, but they soon settle. I love being a part of their world and listening to all the sounds they make. They chatter while they nibble. Sometimes it’s very clear what one is saying. I feel as though I’m learning to speak (or at least understand) chicken. My favorite sounds are when they are content, and they hum a soft, peaceful tune. With temps in the 30s, my rose hip mint tea is cooling rather fast. The girls have grown some nice downy feathers and are obviously better suited for this cool weather than I am. I take a few photos and meander back into the warmth of my home. I love my slow-paced mornings filled with purpose. Life is good. Watching my girls free range is a magical moment. Time stands still, and I breathe in and breathe out. I think of nothing but what is right in front of me. And all is right with the world. The girls scratch and peck for goodies. Each has her own style. Some scratch, scratch, peck, peck. Some scratch, peck, peck, scratch. Their simple–yet effective–acts are mesmerizing and seem to lull me into a hypnotic trance of serenity. Peace is all around me, except for the occasional disagreement over whose worm that really is. And then a game of “catch me if you can” commences, complete with chicken running which is a sight to behold. There are many styles to chicken running, and all are very humorous. These relaxing Sunday mornings are always a precursor to such a fabulous day. Whether you have chickens to watch or other Sunday morning delights, may your day be filled with peace and happiness. As today’s forecast threatens snow, I’m thrown into a near panic thinking about all the little coop and yard chores I have yet to finish. I must be a bad chicken mommy for not having attended to these chores already. But, life is what happens while you’re busy making plans. I’ve been planning what to do with the wonderful crop of rose hips I just harvested. And what to do with the enormous amount of mint I have collected? 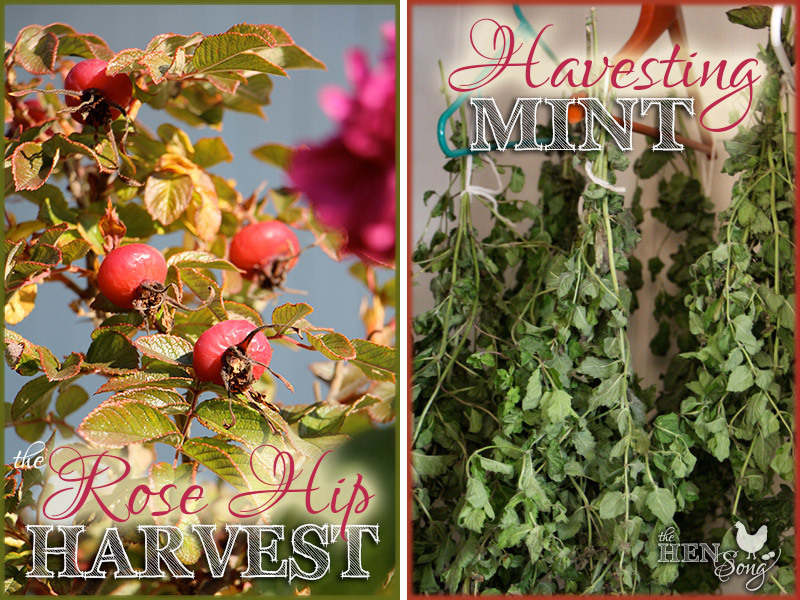 Most likely the mint, and perhaps the rose hips, will be dried and put up for winter to be used in teas on cold winter mornings. The dried mint will come in handy in the coop bedding throughout the winter. As long as winters are up here, it’s a good thing I have so much. I’m determined to make something yummy with with at least some of the rose hips. Eating them raw I’ve discovered they are very sweet and tasty–larger and sweeter than the wild ones I sample while hiking local trails. But the processing of these bountiful goodies will have to be put off for today. The threat of snow has launched me into the “get ‘er done” mode. My coop could actually survive winter just fine in its current state. However, there are a few niceties that I’d like to do to help make winter more enjoyable for the girls and for me! So, enough with the small talk. I’m off to suit up and head out into the brisk morning air and accomplish all sorts of wonderful chores. Have a great day! What is the hen song? Well, once you hear it, you'll know! 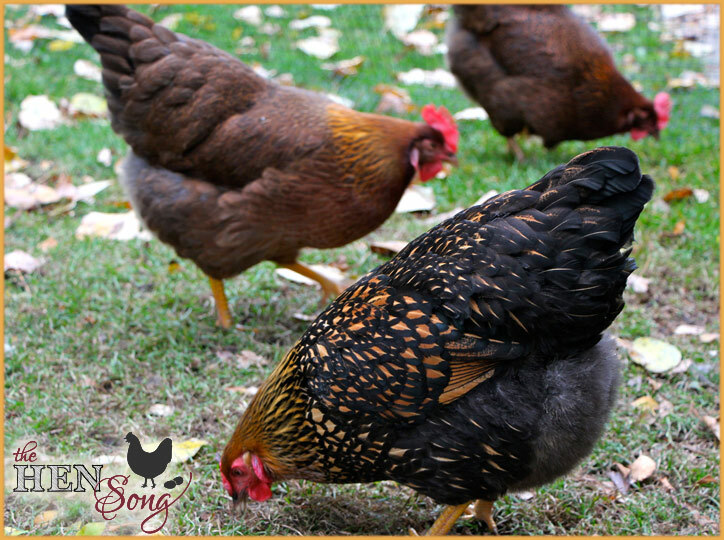 When a hen has just laid an egg–or is getting ready to lay an egg–she will sing out loud and proud! Each hen is different, and not all gals sing. Some just lay their egg quietly and go on their merry way. Others want the whole world to know that they just did something totally incredible! Growing up in New England we would often visit farms to pick apples, pumpkins and Christmas trees. 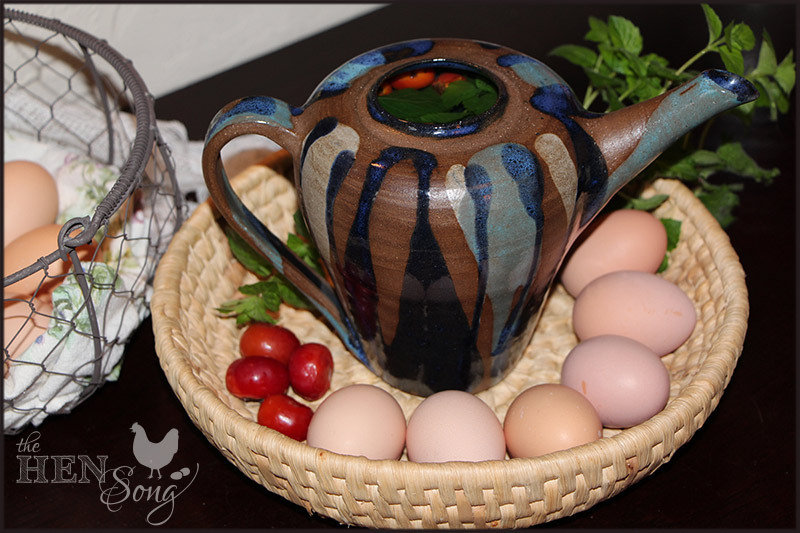 Since moving to Alaska some 20 years ago, I have learned to fish and dipnet, smoke salmon and halibut, grow my own vegetables, make preserves from the berries I harvest, bake bread from organic ingredients, and raise happy, healthy chickens for beautiful, healthy eggs. I am happier and healthier knowing where my food comes from. And the choices I make have a direct effect on the environment in which I live. Life is good. And getting better all the time!